Great sign programs don’t just happen by accident. Great sign programs require extensive planning. They require thorough project management. They require an intense focus on meeting deadlines and willingness to push the process forward when obstacles get in the way. They require nothing less than an unwavering commitment to finishing the job on time and finishing it right. We handle all the details of your sign management project, including working with your brand consultants, prototype design and development, engineering, manufacture, permitting, installation, sign maintenance management and more. We call it the Egan Sign 360. And we manage it with proprietary software that we developed specifically for that purpose. It helps ensure we can keep our pledge of total customer satisfaction. We work hand-in-hand with your design and branding team to ensure that your signage is designed economically and with local sign regulations in mind so they can be installed consistently across your facilities. Our goal is to help you create programs that save you money, time and headaches. We’re able to create a strong brand program with the flexibility to meet the constraints and requirements of a variety of locations. We take the hassle out of permitting by getting your signs approved by all the municipalities where your company does business. It can be a long, arduous process, and Egan Sign can provide you with the expertise to interact directly with local officials and ensure that all designs are approved within the desired timeframes. Full-scale prototypes allow you to visualize and test new sign designs before committing to a final product. 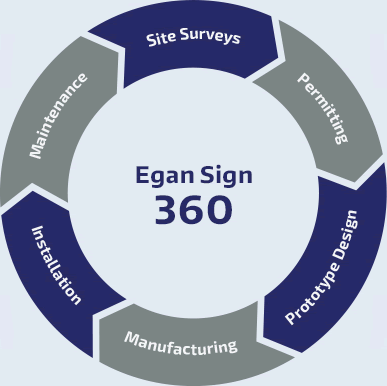 With Egan Sign’s process, you have model signs to evaluate and share with your key stakeholders. Sign management doesn’t end when signs are installed. It’s important to always be mindful of maintenance-related matters. Even the best made signs won’t last forever. Eventually they will need to be serviced, replaced or repaired. Sign maintenance is almost always a budget drain and a headache, but poor lighting, peeling paint and faded images can send the wrong message to customers. Sign maintenance management is important to the overall image of any company. We provide cost-effective sign service and maintenance programs, keeping your signs consistent, updated and fresh. We help ensure that the appearance of your signs safeguards your company’s brand and reminds customers of the high quality that sets you apart from competitors. 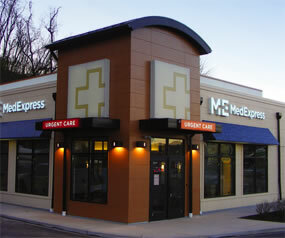 We are the experts in managing multi-location, one-of-a-kind sign programs. Exactly what you need, when you need it.